With vehicle details so we can help ensure this part fits your vehicle - we aim to respond within 2 working hours. 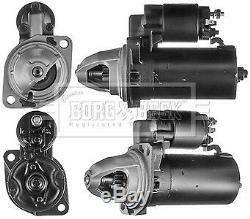 VOLVO 164 2.9 Starter Motor 68 to 74 B&B. BMW 7 (E23) 728 i. VOLVO 140 (142, 144) 2.0. VOLVO 140 (142, 144) 2.0 S.
VOLVO 140 Estate (145) 2.0 S. VOLVO 164 (164) 2.9. VOLVO 164 (164) 2.9 E. VOLVO 240 (P242, P244) 2.0. Model year from: 03/1979; Model year to: 08/1982; Transmission ID: 4, A. Model year from: 04/1991; Transmission ID: AV70/71, M47. Model year to: 06/1985; Transmission ID: M45R. Model year to: 06/1987; Transmission ID: AV70/71, M46, M47. Model year from: 09/1976; Transmission ID: M45R. VOLVO 240 (P242, P244) 2.1. Model year to: 02/1979; Transmission ID: M45R. Model year to: 08/1982; Transmission ID: M46. Model year to: 07/1979; Transmission ID: M45R. VOLVO 240 (P242, P244) 2.1 Turbo. Model year from: 09/1982; Model year to: 06/1984; Transmission ID: M46. VOLVO 240 (P242, P244) 2.3. Transmission ID: 4M+OD, A, M46. Model year to: 06/1985; Transmission ID: M46. Model year to: 07/1982; Transmission ID: 4M+OD. Model year from: 03/1979; Model year to: 07/1979; Transmission ID: M45R. VOLVO 240 Kombi (P245) 2.0. Model year from: 07/1981; Transmission ID: 4. Model year to: 06/1987; Transmission ID: M46, M47. Model year from: 07/1981; Model year to: 08/1982; Transmission ID: 4. VOLVO 240 Kombi (P245) 2.1. VOLVO 240 Kombi (P245) 2.1 Turbo. Model year from: 07/1981; Model year to: 06/1985; Transmission ID: 4M+OD, M46. VOLVO 240 Kombi (P245) 2.3. Model year to: 06/1984; Transmission ID: AV70/71, M46. VOLVO 340-360 (343, 345) 2.0. Model year to: 06/1984; Transmission ID: M47. Model year to: 08/1982; Transmission ID: M45R. Model year from: 09/1982; Model year to: 06/1984; Transmission ID: M47. VOLVO 340-360 Saloon (344) 2.0. Model year to: 07/1989; Transmission ID: CVT, M45R, M47. VOLVO 740 (744) 2.0. Model year to: 06/1987; Transmission ID: M46. Model year to: 06/1987; Transmission ID: M47. Model year to: 06/1987; Transmission ID: AW7. VOLVO 740 (744) 2.3. Model year to: 06/1987; Transmission ID: AW7, M47. Model year to: 06/1987; Transmission ID: M46, ZF22. Model year from: 07/1985; Model year to: 06/1987; Transmission ID: AW7, M47. Model year to: 07/1987; Transmission ID: AW7, M47. VOLVO 740 (744) 2.3 Turbo. VOLVO 740 Kombi (745) 2.0. VOLVO 740 Kombi (745) 2.3. VOLVO 740 Kombi (745) 2.3 Turbo. VOLVO 760 (704, 764) 2.3. VOLVO 760 (704, 764) 2.3 Turbo (704). Model year to: 06/1985; Transmission ID: M46, ZF22, AV. Model year from: 07/1983; Transmission ID: M46, ZF22, AV. VOLVO 760 Kombi (704, 765) 2.3 Turbo. Model year to: 12/1989; Transmission ID: M46, ZF22, AV. VOLVO 940 (944) 2.0. VOLVO 940 (944) 2.0 Turbo. VOLVO 940 (944) 2.3. VOLVO 940 (944) 2.3 Turbo. VOLVO 940 Mk II (944) 2.3. VOLVO 940 Mk II (944) 2.3 ti. VOLVO 940 Mk II (944) 2.3 Turbo. Model year from: 03/1996; Model year to: 12/1997. VOLVO 940 Mk II Estate (945) 2.3. Model year from: 02/1995; Model year to: 07/1998. VOLVO 940 Mk II Estate (945) 2.3 ti. VOLVO P 1800 (P18) 2.0 ES. The item "VOLVO 164 2.9 Starter Motor 68 to 74 B&B Genuine Top Quality Replacement New" is in sale since Wednesday, February 28, 2018. This item is in the category "Vehicle Parts & Accessories\Car Parts\Electrical Components\Starter Motors". The seller is "carpartsinmotion" and is located in Leeds, United Kingdom. This item can be shipped to United Kingdom, Antigua and barbuda, Austria, Belgium, Bulgaria, Croatia, Cyprus, Czech republic, Denmark, Estonia, Finland, France, Germany, Greece, Hungary, Ireland, Italy, Latvia, Lithuania, Luxembourg, Malta, Netherlands, Poland, Portugal, Romania, Slovakia, Slovenia, Spain, Sweden, Australia, United States, Canada, Brazil, Japan, New Zealand, China, Hong Kong, Norway, Indonesia, Malaysia, Mexico, Singapore, South Korea, Switzerland, Taiwan, Thailand, Bangladesh, Belize, Bermuda, Bolivia, Barbados, Brunei darussalam, Cayman islands, Dominica, Ecuador, Egypt, Guernsey, Gibraltar, Guadeloupe, Grenada, French guiana, Iceland, Jersey, Jordan, Cambodia, Saint kitts and nevis, Saint lucia, Liechtenstein, Sri lanka, Macao, Monaco, Maldives, Montserrat, Martinique, Nicaragua, Oman, Pakistan, Peru, Paraguay, Reunion, Turks and caicos islands, Aruba, Saudi arabia, South africa, United arab emirates, Ukraine, Chile.